The documents attached are: Teacher notes and solutions, Utilities Puzzle stickers. The worksheets zip folder contains: Graphs and shapes, Euler Characteristic Formula, Graphs and patterns, Famous graphs puzzles, Mug solutions, The Utilities Puzzle Proof. Most activities just require the students to have something to write with and the activity sheets. However, for 'Mug solutions' students will need to bring a mug in (that they are allowed to draw on!) and they will need access to dry-wipe pens to draw on to the mug with. 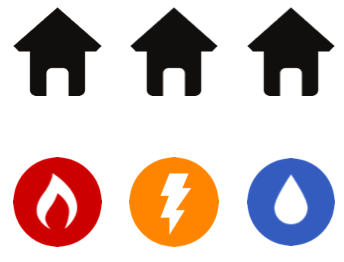 We have also made a class set of stickers with the house and utilities symbols on them. These can be printed out so the students can stick the symbols on their mug. The sticker sheet is designed to fit on to the following Avery stickers: Avery L7160-40, 63.5 x 38.1 mm labels, 21 per sheet. The activities are all based around graph theory, but also involve the following areas of maths: Properties of 3D shapes, number patterns, counting problems, writing formulae, proof by contradiction. The students will also need to use their skills in problem solving and being systematic. On the diagram on the left, can you draw lines so that each house is joined up with all three of the utilities it needs (gas, electric and water), without the lines crossing each other? This puzzle is called the Utilities Puzzle and these classroom resources are based around it. The resources consist of activities about graph theory (the area of maths the Utilities Puzzle is all about), and include some activities specifically about the Utilities Puzzle. The 'Teacher notes and solutions' gives more information about which activities are stand-alone and which are linked. Read the teacher notes before doing the activities.